It began in March 1948 as a senior class project. Called by the local paper “the most ambitious attempt in the theatrical line ever made by the University students,” the Red ’n’ Black Revue has also proven to be the longest running show in New Brunswick. For every year but two of the past 63 years, the much acclaimed and eagerly awaited variety show has entertained large audiences that include students, faculty and staff, parents and members of the community. 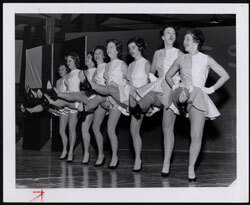 In 1965, having outgrown the auditorium at Teachers’ College, the production moved to The Playhouse, a well-appointed theatre in downtown Fredericton. 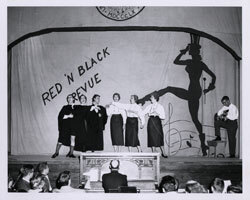 About this time the Red ’n’ Black Revue began attracting participants with professional show business potential, most notably Anne Murray (BPE ’66) who claims it’s where she found out she was a more talented singer than most people. In addition to the annual production, there have been several special Red ’n’ Black Revues. 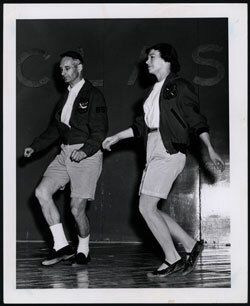 In 1955, a command performance in front of Lord Beaverbrook, UNB’s chancellor, was staged at Memorial Hall. In 1962, the centenary of the Associated Alumni reached its grand finale at the Lady Beaverbrook Rink with a revival that featured highlights of the show since its inception. A 50th reunion performance at The Playhouse in 1996 boasted a cast that spanned five decades, as well as an appearance by UNB’s newly appointed president, Elizabeth Parr-Johnston. Then, at UNB’s millennial alumni reunion in 2000, another revival packed the Aitken University Centre with a sold-out crowd of more than 2,400 enthusiastic fans.